A while back I wrote a post about how we can create a build bagde in TFS just like some of the other CI server can. It was actually really simple but since it was a custom extension it needed to be deployed outside of TFS, which of course is a bit of a pain. With TFS 2015 RC and the new build system I’m happy to see there is now a new feature that let’s you get a build badge automatically! So with this my suggestion on Uservoice can be closed. 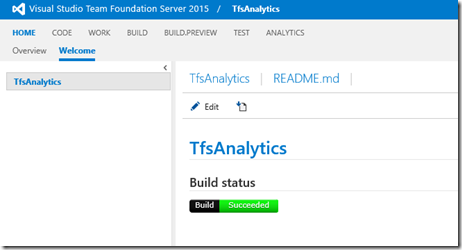 Subscribe to comments with RSS or TrackBack to 'Build Status Badge for TFS 2015 and VSO'. Thanks for this post, Mathias! I have promptly incorporated it into my project wikis on VSO as well as my Frankenbuild site for extra visibility. Thanks, I think this is a nice small gem that gives that extra eye-candy to the project wiki. Great for visibility as you say. This is a nice feature to build a dashboard of all CI builds, but I find it more convenient when the build status is always on my screen. And with the missing support for vNext Builds in MS Build notification tool, https://catlight.io seems to be the only option for now.